There’s not a better way to unwind than a soothing massage. Massage therapy, once a luxury that was only found in spas and resorts, has become a main component of the alternative medicine movement. Massage therapy is a practice that dates back thousands of years ago, however, today the practice has developed into a diverse profession that utilizes a wide range of movements, pressures, techniques that are helpful are relieving pain and soreness. Massage therapy has been clinically proven to be beneficial in reducing a variety of pain, soreness, and it can even help a variety of medical conditions. Whether or not you have visited a massage therapist before, there are plenty of reasons to receive a professional massage. And, when it comes to massage therapy in Bakersfield, CA, Core Chiropractic and Wellness has you covered. Our wellness practice takes pride in being the premier provider of massage therapy in Kent County, offering the best massage in Bakersfield. 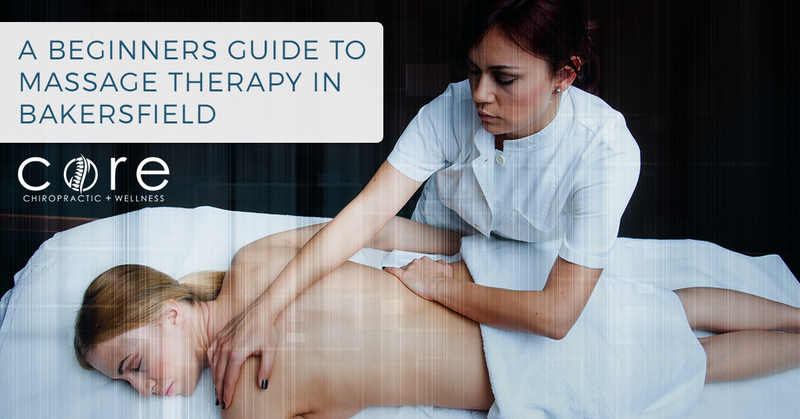 Because massages are so great, we put together a massage therapy guide! Massage therapy is a medical and healing practice that has been practiced for thousands of years. It has been used in many cultures around the world and is used today for relief from a variety of health-related issues and conditions. Massage therapy is a manual manipulation of the body’s muscles, tendons, ligaments, and tissue, all of which contribute to enhancing a person’s health and well-being. The main focus of massage therapy is to help relieve pain and tension located in the muscles, tendons, joints, pressure points, and ligaments by creating a relaxing response to help uncover the root causes of pain, muscle spasms, or the buildup of fluid. The importance of massage therapy should never be underestimated, however, it often is. Massage therapy is not only good for the bodies’ general health, it can help improve performance in everyday activities. We use our bodies in repetitive ways, like sitting at a desk for long periods of time during work hours, constantly driving, or just going through normal daily activities. These consistent activities can sore and tense muscles, tendons, and ligament, or it can even lead to injury. When muscles and ligaments are under strain, like during stress or exercise, they can become irritated, causing — sometimes chronic — pain and affecting their ability to perform everyday activities. Athletes. Massage therapy can help athletes reduce body soreness, restore overused and inflamed body tissue, and prevent joint injury. It can also help improve athletic performance. Pregnant women. Pregnancy comes with many symptoms, including back, neck, and shoulder pain. With body changes putting extra pressure on the joints and muscles, massage therapy can help ease some of the pain and soreness and it can help create a healthy environment for the developing baby. Senior citizens. Many senior citizens have damaged muscle tissue caused by overuse from years of work, travel, athletics, and other activities. Visiting a professional massage therapist can help revitalize overused muscles, ligaments, tendons, and tissues in seniors. Working professionals. Our jobs can really take a toll on our bodies. Many of today’s jobs involve sitting at a desk for long periods of time, such as the job of an accountant. Other jobs have more physical demands, like working in construction. While these jobs are different, both of them — and plenty of other professions — can have an extreme effect on posture, muscles, disks, balance, coordination, and more. Massage therapy can help improve posture, relieve soreness in muscles, and can take pressure off of joints. People under stress. Let’s face it, life can often be stressful. The techniques, movements, and pressures of massage therapy have been clinically proven to help reduce the amount of stress in patients. Whether work or something else has you feeling tense, a massage could be the perfect solution. There is a wide variety of techniques that can be used during massage therapy to help manipulate muscles to relieve pain and tension. Each technique comes with its own set of benefits. Check out some common and effective massage therapy techniques, many that we practice at Core Chiropractic and Wellness! The most common form of massage therapy is the Swedish massage. This technique focuses on tension relief for muscles, using five specialized strokes and movements. This long, flowing strokes and movements are used to help relax and restore muscles in the body. Using hot stones is another popular massage therapy method. This technique uses warm, soothing stones that are placed on top of specific areas of the body, such as the back, to help loosen and relieve muscles and tissues underneath the skin. The heat from the stones help alleviate pain, increases relaxation, and reduces stress. A deep tissue massage is a technique that many clients request from their massage therapists. This technique focuses on the deeper layers of muscle tissues. The gentle, deep strokes of deep tissue massages help loosen muscles and alleviate pain. The effects of a deep tissue massage generally last longer than those of a typical massage. Pregnancy massages use specific techniques, movements, and pressures that have been proven to reduce the painful and discomforting symptoms that come with carrying a baby. These massages enhance the physical and emotional health and well-being of both the expectant mother and developing baby. For those in the post-pregnancy period, postpartum massage therapy techniques can help rebalance the structure of a woman’s body after giving birth. This technique can help improve skin elasticity as well as muscle tone. It can also help ease the psychological effects of giving birth, including postpartum depression. Hopefully, this information has helped you learn more about massage therapy. Be sure you keep an eye out for our next blog, as we will cover some — of the many — benefits of massage therapy. Ready for the best massage in Bakersfield? If you think that you could use a professional massage, let the team at Core Chiropractic and Wellness help! Our certified massage therapists can help patients find pain relief and relaxation without the use of prescription medications. From back and neck pain to poor posture, personal injuries, and headaches, when used in combination with chiropractic care, massage therapy can have seemingly-endless benefits, which we will learn about in our next blog. If your ready to discover the difference of the best massage therapy in Bakersfield, schedule an appointment with one of the certified massage therapists at Core Chiropractic and Wellness!